Emerging technologies such as IIoT, robotics and artificial intelligence provide exciting opportunities for supply chains. They also mean an exponential growth in the amount of data these supply chains generate. When properly utilized, this data can provide crucial information to improve efficiency, reduce costs, enhance transparency and customer service. But it comes with risk. The more digitized a supply chain becomes, the more it is at risk of cyberattack. Hackers are constantly finding new ways create data breaches they can exploit. The reality that most supply chains require third-party suppliers down the chain only heightens this threat. No matter the scale of your supply chain, it is essential to have solid cybersecurity processes in place to manage and mitigate the growing risk of cyberattack. That’s what this issue of MHI Solutions is all about, from cybersecurity threats in an IIoT world to dark data to the human factor in cybersecurity to blockchain as a potential solution. For cybersecurity to work, collaboration is essential across the extended value chain of internal stakeholders, suppliers, sub-contractors and the end consumer. By working together, companies can manage and mitigate risk while taking advantage of all the opportunities offered by digital supply chain technologies. MHI supports the growth of emerging manufacturing and supply chain technologies at our events including the ProMat expo next April in Chicago. ProMat is expanding the showcase of new and emerging technologies in 2019 by featuring a Solution Center on Emerging Technology. This Solution Center will feature exhibits and education on these important supply chain trends including solutions for robotics and automation, artificial intelligence, autonomous vehicles, blockchain and the IIoT. You can learn more at ProMatShow.com. Additionally, MHI is offering educational and networking opportunities on NextGen supply chain technologies at our MHI Annual Conference and Executive Summit event being held as you read this in Orlando, FL. For the fourth year, we are inviting MHI members and non-members to attend, creating an event venue for material handling and supply chain collaboration. This event focuses on key themes identified in the U.S. Roadmap for Material Handling & Logistics 2.0 and the 2018 MHI Annual Industry Report. The goal is to create a growing community that connects and collaborates to address current and future manufacturing and supply chain challenges and opportunities. Supply chain thought leaders are sharing insights and strategies on the top issues affecting our industry including robotics, IIoT, cybersecurity and blockchain. 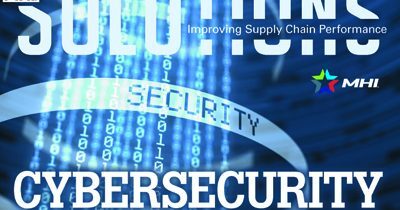 Our objective is that this issue of MHI Solutions helps provide the information and resources you need to address cybersecurity risk across your supply chain to improve your overall business performance.